Sydney Sixers remained right in the hunt for a semi-final place with a big win over current BBL champions Adelaide Strikers as they comfortably chased down the 124 set for them, claiming an eight-wicket win. The Sixers still have work to do if they want a spot in the finals but they are also chasing a home game in the finals and they can edge closer to that with a win over one of the teams who are in the chasing pack behind them. Coach Greg Shipperd has seen no reason to change his in-form side after three wins in a row, naming an unchanged squad for this contest with captain Moises Henriques will again be looking to lead from the front after an unbeaten 61 in his side’s last contest. Sydney Thunder lost their important game against Melbourne Renegades, a result which left the Thunder outside of the play-off spots and they will now need to win their last two games and hope other results go their way if they are to seal an unlikely place in the finals. The Thunder’s poor batting performance was the key factor in their defeat to the Renegades. Chasing down 141 for the win, Thunder were bowled out for 113 as they lost by 27 runs. Teenage wicket-keeper Baxter Holt is set to keep his place in the side after an impressive debut performance in which he posted 37 runs with the bat and was involved in three dismissals with the gloves. 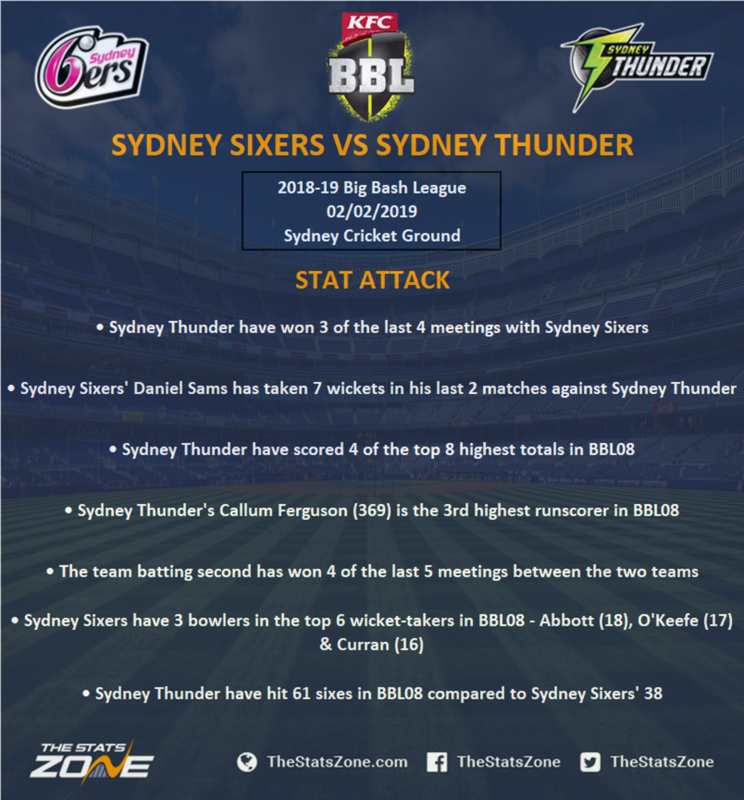 The Sydney Smash will be pivotal for the fate of both teams in their penultimate game of BBL08. The Sixers are in a strong position to make the finals and need just one win from their final two matches to seal a semi-final berth. The Thunder on the other hand have plenty of work to do and need lots of things to go their way even if they win. The Sixers’ batting line-up could prove too potent here and will ensure they make the finals whilst eliminating their rivals in the process.